Sidelined through a knee injury, the Mariners' skipper has decided to bring his time at the club to an end with mutual consent. 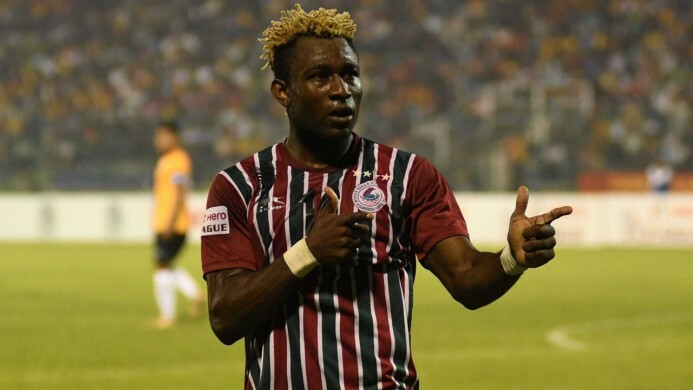 Mohun Bagan's talismanic Haitian winger Sony Norde decided to terminate his contract with the Mariners with mutual consent. The 28-year old winger is set to fly to Argentina on 23rd January to have surgery on his right knee which has been troubling him since last season. The surgery is slated to take place on 3rd February and post-surgery the Haitian international will have his rehabilitation in the Boca Juniors Academy for three months. Norde is expected to conduct a press-conference on 22nd January (Monday) to announce his decision and Bagan officials are standing by his decision. The Bagan skipper sustained the injury to his right knee against Churchill Brothers and had to be stretchered off the field. He has featured only once since then which was against NEROCA FC in the middle of December last year. When Norde had consulted orthopaedic surgeon Dr Anant Joshi in Mumbai about his injury, it was suggested that he need not go under the knife and through rehabilitation, he could get back to prime fitness. The Haitian international has won all major domestic trophies, namely the I-League in 2014 and the Federation Cup in 2015, with Mohun Bagan. Since his signing, he has been a heartthrob for all Bagan supporters. He has won “Golden Ball” for the Mariners in the 2015 season in which Mohun Bagan won the I-League after 13 long years. The Green and Maroon officials are already in talks with Ethiopian striker Fikru Teffera Lamessa to be his replacement or they might even get a good defender to replace the Haitian.